49107 SPE NORTH KOREA (1990) Peacocks*. Set of 2 overprinted SPECIMEN. KSC Nos 2977-8. Scott Nos 2909-10. 67881 SPE NORTH KOREA (1990) Birds. Set of 5 specimens. Scott Nos 2957-61, KSC Nos 3035-9. 58302 MAX F.S.A.T. (1990) "Bird" by Folon*. Maximum card. Scott No C113, Yvert No PA114. 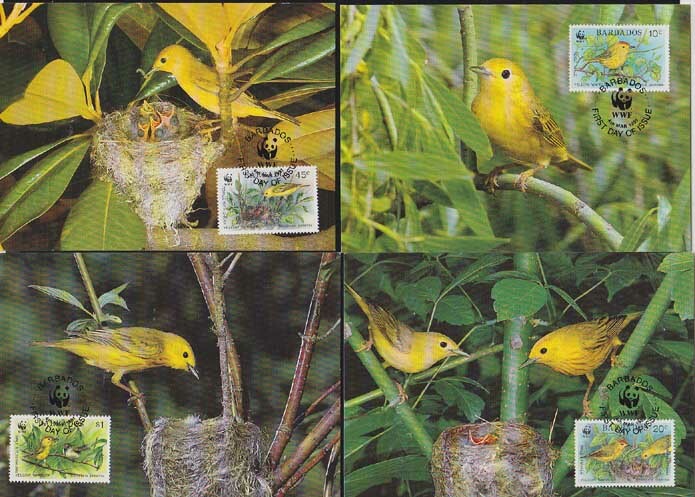 63500 MAX BARBADOS (1991) Yellow warblers*. Set of 4 maxicards with WWF thematic cancels. Scott Nos 795-8, Yvert Nos 804-7. 57932 ND MADAGASCAR (1991) Hoopoe (Upupa epops)*. Imperforate S/S. Scott No 1036. 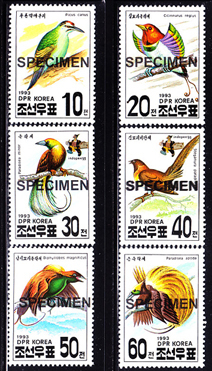 67884 SPE NORTH KOREA (1991) Endangered birds. Set of 6 specimens. Scott Nos 2971-6, KSC Nos 3051-6. 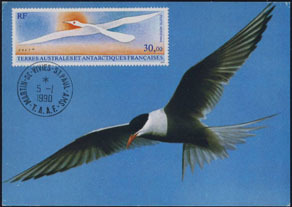 49116 SPE NORTH KOREA (1991) Birds*. Set of 6 overprinted SPECIMEN. KSC Nos 3051-6. Scott Nos 2971-6. 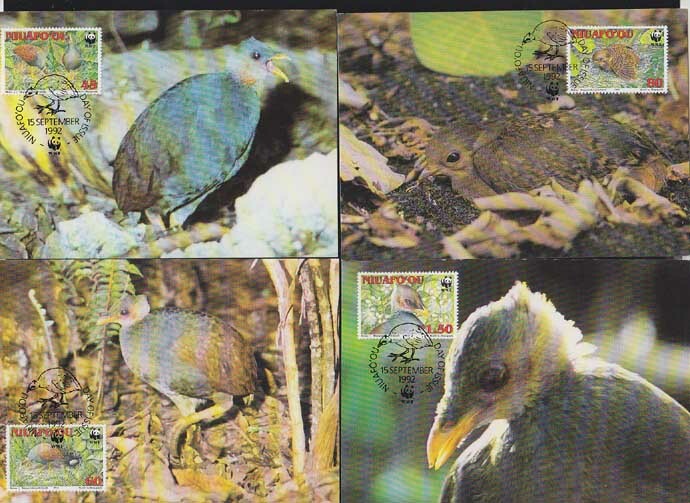 63531 MAX NIUAFO'OU (Tin Can Island) (1992) Megapodes*. Set of 4 maxicards with WWF thematic cancels. Scott Nos 152-5, Yvert Nos 175-8. 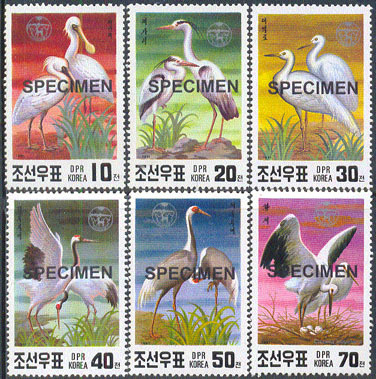 67912 SPE NORTH KOREA (1992) Birds. Set of 6 specimens. Scott Nos 3098-3103, KSC Nos 3193-8. 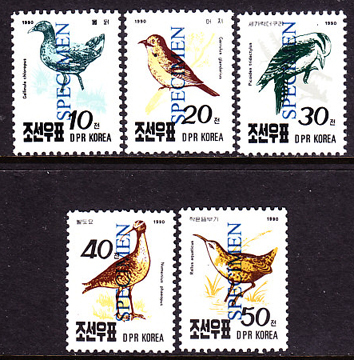 67941 SPE NORTH KOREA (1993) Birds. Set of 6 specimens. Scott Nos 3219-24, KSC Nos 3342a-e.
49145 SPE NORTH KOREA (1993) Birds*. Set of 6 overprinted SPECIMEN. KSC Nos 3342a-f. Scott Nos 3219-24. 58286 MAX F.S.A.T. 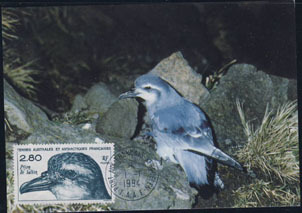 (1994) Salvin's prion*. Maximum card. Scott No 197, Yvert No 189. 58205 FDC F.S.A.T. 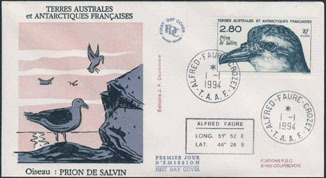 (1994) Salvin's prion*. FDC with cachet. Scott No 197, Yvert No 189. 77162 ND SIERRA LEONE (1994) White-necked picathartes (Picathartes gymnocephalus)*. WWF emblem*. Imperforate. Scott No 1738b. 77163 ND SIERRA LEONE (1994) White-necked picathartes (Picathartes gymnocephalus)*. WWF emblem*. Imperforate. Scott No 1738c. 77164 ND SIERRA LEONE (1994) White-necked picathartes (Picathartes gymnocephalus)*. WWF emblem*. Imperforate. Scott No 1738d. 49165 SPE NORTH KOREA (1995) Tree sparrow*. Sea Cucumber*. Set of 2 overprinted SPECIMEN. KSC Nos 3584-5. 68218 SPE NORTH KOREA (1995) Tree sparrow. Sea slug. Set of 2 specimens. Scott Nos 3456-7, KSC Nos 3584-5. 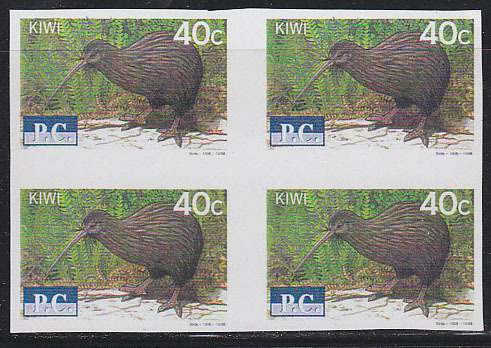 75890 LOC NEW ZEALAND (1998) Kiwi*. Posties Choice imperforate bl/4 40c stamps. 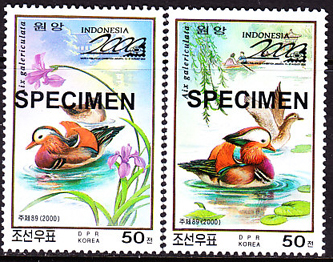 68368 SPE NORTH KOREA (2000) Mandarin ducks. 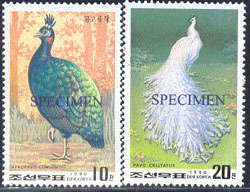 Set of 3 (2 stamps + S/S) specimens. Scott Nos 4055-7, KSC Nos 4048-50. 68371 SPE NORTH KOREA (2000) Mandarin Ducks. 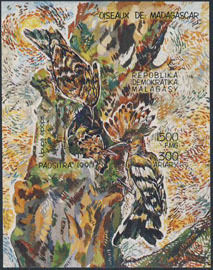 Set of 2 specimens overprinted for Indonesia 2000 Exhibition. Scott Nos 4071-2, KSC Nos 4063-4.